Home > Credit Cards > What Are the Consequences of Going Over Your Credit Limit? Credit cards certainly have their limits, but it is often possible to go over them. And is going over your credit limit bad? When you go over the limit on your credit card two key things can happen—you pay an over-limit fee and you hurt your credit score. Due to restrictions in the Credit Card Accountability, Responsibility and Disclosure Act, some issuers have stopped letting cardholders spend beyond their credit limits. Others still have a credit card equivalent of overdraft coverage. That option, though, comes at a price. If you go over your limit, you’re charged an over-limit fee of up to $25 for the first instance and up to $35 for the second, per the Consumer Financial Protection Bureau. Your credit score can also end up taking a hit. Credit utilization, or credit utilization ratio, is how much debt you’re carrying compared to credit that’s been extended to you. Credit utilization, also known as debt utilization is a major component of most credit score scoring models. To maximize your score, it’s generally recommended that you keep the amount of debt you owe—collectively and on individual credit cards—below 30% and ideally no more than 10% of your total available credit lines. Consider a credit card with a credit limit of $2,500 that’s maxed out with a balance of the full $2,500. That’s 100% credit utilization. To hit the sweet spot of 10%, you need to carry a balance of no more $250 on that card. No more than $750 is the 30% maximum upper limit. Maxing out your credit cards lowers your credit scores. The amount of the hit to your score varies depending on where your score is at the time you maxed out the account. For example, someone with a good score of 780 would weather anywhere from a 25 to 45 point drop for using all their available credit limit, according to a test scenario conducted by popular credit scoring model FICO. Going over your limits makes things worse. VantageScore, another popular credit scoring model, may also penalize consumers for going over their limits, though, according to a spokesperson, it caps utilization at 110% –meaning if your utilization is actually at 120%, it would only be considered as 110%. That 110% on your credit card with a limit of $2,500 limit would equal a balance of $2,750. Of course, going over your credit limit only affects your credit score if the issuer reports the faux pas to the three major credit reporting agencies. Some may not, and in other instances, you can keep it off of your reports by paying off the excessive balance before your statement’s billing date. You can check with your card company to learn specifically how and when they report an over-the-limit balance to the credit bureaus. Regardless of how credit card companies handle the situation, it’s a good idea to avoid charging beyond your credit limit. And an even better idea to avoid charging beyond 30% of your limit. If you do need to max out your credit card pay off the overage quickly. In addition to the initial over-limit fee, you could be faced with a penalty APR if you don’t pay off the extra charges in full by the end of the month. Find tips for paying off credit card debt. If you have high credit card debt there are ways to help your credit score other than paying down your balance. You can also request a higher credit limit from the card issuer. Or, you can get a second credit card to increase your credit limit. A higher limit—even across two credit cards—reduces your credit card utilization. 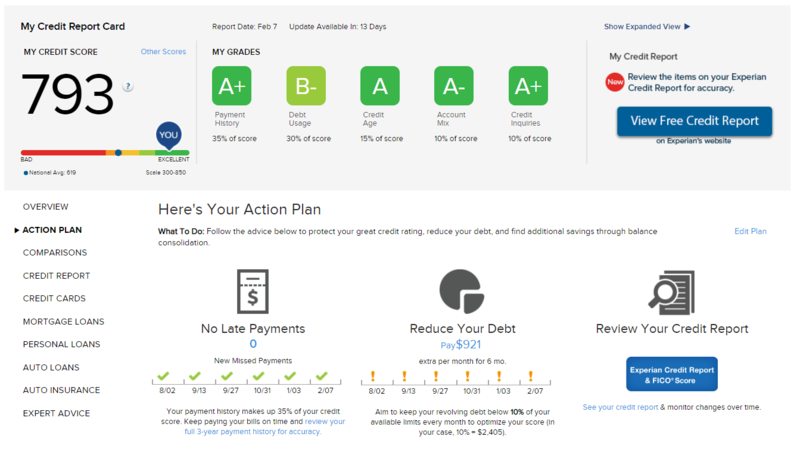 To see how your credit card balances affect your credit scores, you can view your free credit score and credit report card on Credit.com. Your credit report card includes a view of your credit utilization. And your score and report card are updated every two weeks.